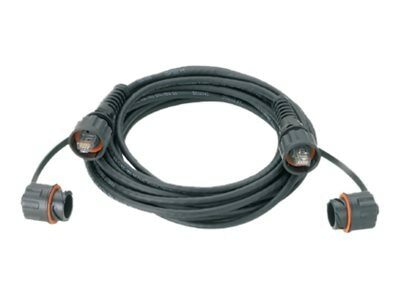 IndustrialNet TX6A patch cords provide an ideal solution to support industrial Ethernet from the Local Area Network (LAN) based support offices to the processing devices on the plant floor even under harsh industrial conditions. Innovative design features provide a secure, reliable connection for superior data transmission in work cells where moisture and dust/ particles are encountered, in temperature extremes and in applications with vibration. Industrial bulkhead connection protects and seals against dust and water immersion common in the food and beverage industry where bacterial contamination is present and light wash down is required. High temperature resilience of up to 85°C storage and 70°C operating offers reliable connection in manufacturing facilities such as metal processing, welding, and chemical batch processing where high temperatures are normal. In automotive panel stamping plants and work cells where vibration is a concern, the IndustrialNet TX6A patch cords protect the RJ45 mating.